Lasers are definitely effective for rejuvenation, and various lasers are being used for the purpose. ‘Juvenile’ means young and ‘rejuvenation’ means becoming young again. This word can be easily confused with ‘anti-aging’, which means preventing the process of aging, slightly different from rejuvenation. 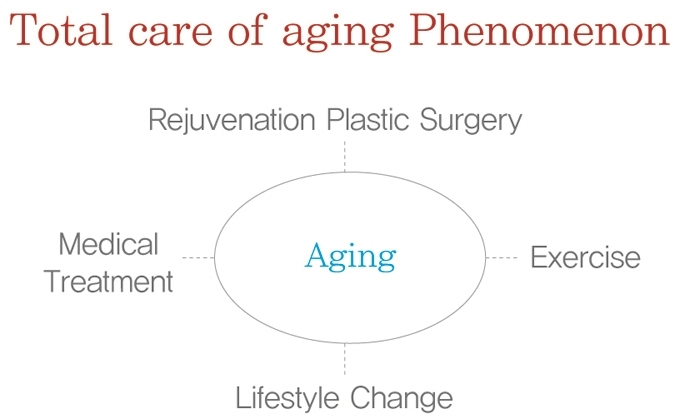 Anti-aging is mostly focused on medical treatments, such as hormone therapy, prevention and treatment of metabolic diseases and aging-associated diseases. On the other hand, rejuvenation is a more aggressive method to turn back the youth. Everybody is bound to experience the aging process when they grow old; people lose confidence in their appearance and don’t even want to look at themselves in the mirror or take a picture. People think of facial wrinkles first among the aging process, but aging is related not only to the facial skin but also to other physical changes, including subcutaneous fat, musculoskeletal system, hormone and metabolic change, as well as psychological and social changes. Aging epidermis of the facial skin becomes withered, shows lentiginosis, age spot and blemishes, and melanin pigment is increased, making the skin color more yellowish than in the younger age. Dermis also becomeswithered, thin and less resilient, the appendages become atrophied, and the skin is dried. Resilient skin contains a lot of collagen fibers, but aging skin has a thick degenerated elastic tissue layer (elastosis). The subcutaneous fat also becomes atrophied and thin in parts, not as evenly distributed as in the younger age, and the facial skin adheres to the muscle, forming deep wrinkles. Nasolabial folds between the cheeks and lips or glabellar frown lines between the eyebrows are deepened. The face also becomes partially sagged, making nasolabial folds, jowl, marionette line and dark circles under eyes. There are retaining ligaments in the face that supports skin and soft tissues; aging face becomes sagged due to the gravity, with the exception of the areas with retaining ligaments. The forehead, eyelids, cheeks and jowl also becomes sagged. The musculoskeletal system also changes; muscles are generally reduced, the bone is reduced in parts, the alveolar bone becomes atrophied and the mouth is puckered. The bone is not constantly fixed but partly absorbed and partly accumulated by new calcium, keeping the balance. When more bone is absorbed then generated, the bone becomes smaller. Aged people have reduced hormone and metabolic change. Growth hormones are necessary not only for growth but also for the maintenance of the body; growth hormone plateaus around the age of 16 and decreases to 20% of the maximum level at the age of 60. Despite the lack of understanding on the accurate reason of aging, there are several theories explaining the reason of aging. The first theory argues that exposure to harmful environments, such as pollution, alcohol, cigarette, overwork and stress, triggers early aging. Programmed aging theory states that aging is imprinted on DNAs and cells are programmed to divide a certain number of times. Aged cells should go through apoptosis, and denaturized cells may turn into a carcinoma. Aging by DNA changes has been partially demonstrated by experiments. Aging becomes accelerated in old people by hormone and metabolic changes. Anti-aging medicine focuses on medication to maintain hormone and metabolism in younger people. Aging also leads to psychological and emotional changes; aging people has decreased memory ability, depressed mood, loss of confidence, psychological withdrawal, contributing the increased risk of depression. As aging includes all these physical, psychological and social changes, total rejuvenation should bring all possible measures to recover youth. In plastic surgery, face lifting is the most traditional but invasive method. For lessinvasive methods, other procedures such as forehead lift by minimum incision or endoscopy are available. Blepharoplasty is commonly performed for sagged eyelids in middle-aged patients. Among laser therapies, ablative laser is an invasive method because it requires more than 1 month recovering the ablated skin. Non-ablative infrared low-output lasers are non-invasive, and fractional lasers are less invasive. 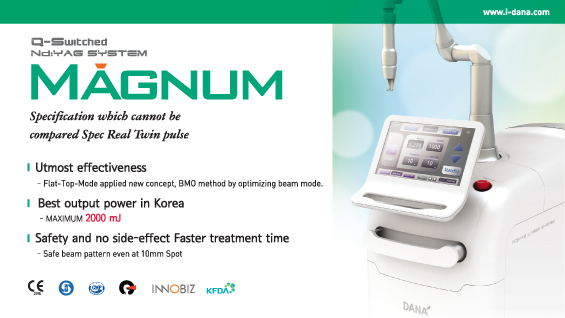 As for the effectiveness, the ablative laser is the most effective; while the infrared low-output laser is weak and the fractional laser yields moderate effectiveness. 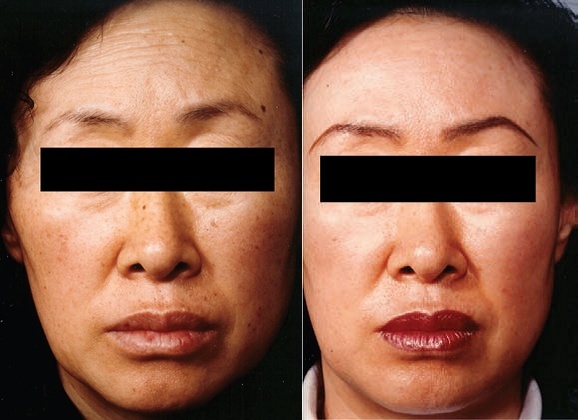 As aged face has atrophied subcutaneous fat, face lifting with fat grafting can recover facial volume and rejuvenate the face. Filler injection can be handy when injecting small amount of fat instead of fat graft. A simple method of relieving wrinkles is to inject botulinum toxin, which paralyzes facial expression muscles. However, the anatomy and physiology of the facial muscles should be fully understood to achieve a proper effect, and misuse may lead to side effects, such as ptosis or long-term inappropriate facial expression around the mouth. Other methods of total rejuvenation include exercise and diet therapy; exercise increases the level of growth hormone, enhances muscular strength and is very helpful for mental health. Bad eating habits and social habits can be improved, and psychology consultation and psychiatric drug treatment can be also helpful, if necessary, to maintain young and healthy mental status. Aging occurs in every part of human body. Therefore, just one method is not enough for rejuvenation and multiple methods selected according to the patient’s needs are most recommended. Among laser therapies for rejuvenation, ablative laser is most effective. After removing the aged epidermis, the skin is regenerated with more regular and thicker epidermal cells and reduced melanin pigments. The ablated dermis also regenerates to thicker collagen fiber layers, enhancing the skin resilience. 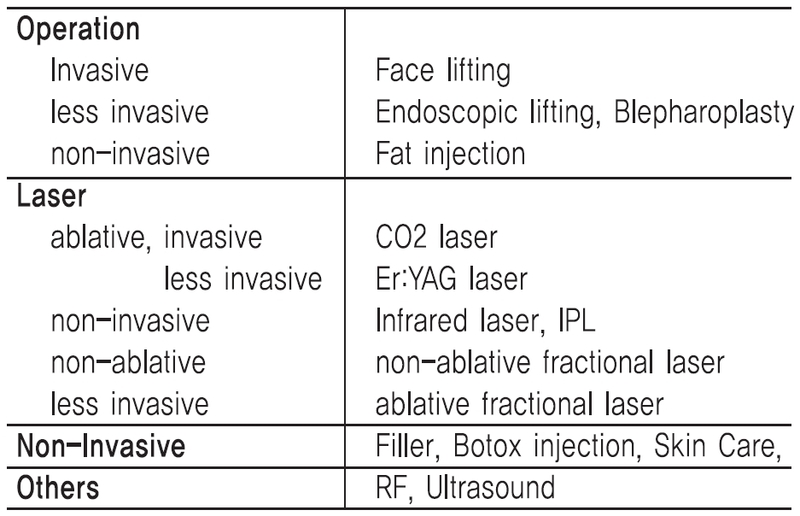 Among ablative lasers, CO2 laser is appropriate for deep ablation but is invasive, while Er:YAG laser is safe and induces less erythema and pigmentation. Among non-invasive lasers, low-output infrared laser and IPL are available, although the expected extent of rejuvenation is not enough to improve wrinkles. The fractional laser can achieve rejuvenation effect by delivering micro-thermal zones to the skin, but the effect is weak and requires repeated treatments. Ablative fractional laser is an intermediate form between the ablative laser and the fractional laser, and the micro-ablative column causes less discomfort in social life. Radiofrequency and ultrasound can also increase the elasticity of the dermis without peeling the skin.